Derry’s renaissance continued with a third qualifier win, Cavan beaten for a third time this season by the Oak Leaf county en route to a Round 4A meeting with Tipperary. 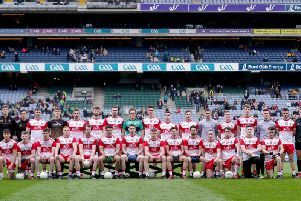 This was Derry’s 24th win in 36 qualifier games since their 2001 victory over Antrim in Casement Park and they are now just one win away from a quarter-final place in the All-Ireland championship. Mark Lynch celebrates victory at the final whistle in the GAA Football All-Ireland Senior Championship Round 3A match between Cavan and Derry at Kingspan Breffni Park in Cavan. (Photo by Brendan Moran/Sportsfile). Yet, despite a superbly timed run onto a right wing cross by Ciaran McFaul and a perfectly fisted close range goal from Emmett McGuckin that gave them an early 1-1 to 0-3 lead, Derry struggled thereafter as Cavan recovered well at Kingspan Breffni Park to take a 0-11 to 1-4 lead to the break, dominant at midfield. Derry lost James Kielt to a black card in the 25th minute but his replacement Enda Lynn would go on to become an influential player in the second half when Cavan tired and Derry ran them ragged for long periods. Kielt had given Derry the lead but three quick-fire points by Mackey, McVeety and a McKiernan free put the home side in control. After McGuckin’s major, Cavan outscored Derry by six points to one in the next 15 minutes, an inspirational Mark Lynch point keeping them in touch. Behind 0-9 to 1-2 ten minutes from halftime, Christopher Bradley and Mark Lynch got Derry’s last two points of the half. However, a red card for Cavan wing-back Feargal Flanagan in first half stoppage time proved the turning point.Flanagan pleaded his innocence and Laois referee Eddie Kinsella felt the wrath of the incensed Breffni fans as he exited the pitch at the break and throughout the second half, but it was the correct decision after he appeared to strike Lynch in the stomach. Cavan’s 14 held their lead until Derry substitute Niall Loughlin converted a 63rd minute 45 for 1-12 to 0-15, McGuckin then racing in from the right wing to put Derry 1-14 to 0-16 up after Lynch, from a free, and Dara McVeety exchanged scores in a highly entertaining final quarter. In added time, Lynn and outstanding substitute Niall Toner - who scored 0-3 in the last 10 minutes - had the large Derry contingent in vociferous mood when they opened a three point gap with time running out. Jack Brady and Player of the Match Lynch (who finished with 0-7) exchanged points before substitute Emmett Bradley should have put the result beyond doubt when put through by Lynn but he elected to go for goal and was denied by the keeper when a point would have extended the lead to four. Indeed, in the final play of the match Dara McVeety saw a snap shot on a loose ball skim the bar, the final whistle sweet music to Derry ears. “The players who came off the bench were key last week and again this week. I said to the boys before the game, the one thing that has been created among the squad has been serious competitiveness. However, as has been a problem all season Derry’s midfield failed to function for long periods: “They were dominating our kick-outs,” added McGuckin. “That was something we were very aware about with Cavan in previous games. We were trying to get men free but they were winning the breaks. “There was a bit of confusion but, at the start of the second half, we moved Chrissy McKaigue on to McKiernan which was a big plus because he did a phenomenal job. Certainly in the second half we put right the wrongs of the first. “When we got to within a point, we really had momentum. Prior to that, it was point for point and could’ve gone either way. But, when we got back to a point, I could really feel a momentum building and we had the right players on the pitch at that time. “We had players with a lot of energy, who could take men on. There was great support off the shoulder, there was a great focal point with Emmett McGuckin and Mark Lynch in the full forward line, so everything worked in our favour. Derry: Thomas Mallon; Gareth McKinless, Christopher McKaigue, Karl McKaigue; Ciaran McFaul, Brendan Rogers, Ciarán Mullan; Conor McAtamney 0-1, Niall Holly; Danny Heavron 0-1, Christopher Bradley 0-1; Eoghan Brown; James Kielt 0-1, Emmett McGuckin 1-1, Mark Lynch 0-7. Subs: Enda Lynn 0-1 for J Kielt Black Card, Niall Loughlin 0-1 for E Brown, Niall Toner 0-3 for C Bradley, Emmett Bradley for C McAtamney, Liam McGoldrick for B Rogers, Neil Forester for C McFaul. Cavan: Raymond Galligan 0-3, Killian Brady, Rory Dunne, Padraig Faulker; Feargal Flanagan, Conor Moynagh 0-1, Martin Reilly 0-2; Tomas Corr, Michael Argue 0-1; Dara McVeety 0-3, Gearóid McKiernan 0-4,Killian Clarke; Cian Mackey 0-1, Jack Brady 0-1, Seanie Johnston 0-1.Subs: Niall Murray for M Argue, Ciaran Brady for P Faulker, Jason McLaughlin for K Brady, Tom Hayes for S Johnston, Gerard Smith 0- for T Corr.